This guide has been designed for anyone running a small or medium-sized business. You do not need any prior knowledge of energy buying to use this guide effectively. Much of the advice is tailored to businesses which use between 32,000 kWh and 120,000 kWh of gas annually, but many of the lessons are applicable to gas consumers both big and small. Come to understand the gas market. Better understand your gas needs. Learn about effective fixed price purchasing. Learn about some alternative buying methods. Get practical advice on how to reduce your gas bills. Why do I need to understand the gas market? Energy procurement strategies are all about protecting your bottom line. Gas and electricity are probably some of your biggest overheads, and if you are working to a tight budget then fluctuating energy prices can be difficult to manage. Failing to understand the gas market, and failing to develop an energy strategy, will result in a failure to control your costs. Natural gas makes up one of the largest and most competitive commodity markets in the world. 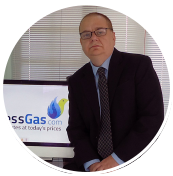 It is difficult to confidently trade natural gas because prices can vary by large margins across short periods of time. Current gas prices are lower than they have been for a number of years, but what should owner-managers do with this information? Is it better to wait and see if prices will drop further, or hedge your bets and buy now? Understanding the energy market is not just about price points and historical data, it is about learning about the various components of the marketplace and how they interact with each other. As it travels from the gas fields to your place of business, gas will be bought and sold several times by suppliers and traders of various sizes. The closer to the source that you buy, the cheaper your gas will be. Smaller businesses can go directly to suppliers, but usually they will not be purchasing in enough volume to register on a supplier’s radar. That’s why businesses use traders or brokers like Business Gas.com to negotiate better rates and to advise on the optimum time to buy. Brokers help businesses understand the complex gas market, including the risks involved and the terms and conditions. Brokers will offer advice on the right time to buy and the right price to bank on. Brokers develop deep bonds with suppliers and are better placed to negotiate for the best rates. What makes up the gas price? There are several components which make up the wholesale gas price. Wholesale gas prices vary so much because the price is influenced by a myriad of factors, including the price of oil, market or political instability, as well as production and storage levels. There’s also an array of third party charges, including distribution and transmission. While wholesale prices have been falling over recent months, these third party charges have increased. Is your gas bill accurate? Many businesses pay too much for their gas, not because they are on the wrong contracts or because they are wasting energy, but simply because they do not have a smart gas meter. Smart gas meters allow businesses to say goodbye to estimated bills and only ever pay for what is used. They also let owners take control of their gas expenditure. They are helpful for identifying areas of wastage and installing one is a useful first step to reducing energy bills. Editor’s tip: I can’t stress how important smart energy meters are. If you take just one thing away from this guide, invest in a good smart meter. Once you have a smart meter, it is important that you learn how to use it effectively. Gather information on your consumption patterns as far back as possible and use a professional reporting platform to spot trends in the data. Knowing how much you use and your patterns of consumption will allow you and your broker to negotiate for a better contract rate. How much gas will you use? Before you formulate an energy strategy, it is important that you know how your consumption might change. If the business is preparing for a period of massive growth, then it might be prudent to choose a shorter contract, so that you can re-evaluate your position more quickly without being hit with steep surcharges. How predictable is your consumption? How certain are any changes to your business model? Will your consumption remain between the usage parameters negotiated in your contract? Fixed price purchasing is the most common form of purchasing for SMEs and provides budget certainty. A fixed energy contract is an agreement whereby the business will pay a set price for a set duration of time, provided their energy use remains within certain limits. Timing is everything when it comes to establishing a fixed energy contract, and buying low is the underlying objective. Many smaller business owners do not know that you can renew your contract in advance of the date of renewal. The volatile marketplace offers opportunities to lock in fixed contracts at lower prices in advance of your contract renewal. Of course, there is always a risk that prices might go even lower after the purchase decision has been made, but your broker can provide market intelligence to inform this purchasing decision. Getting organised will save you money – do not leave gas buying to the last minute. Make sure that you plan ahead so you do not miss opportunities and try to time any renewal for when you predict the lowest prices. Cancel your contract in good time to avoid being trapped into punitive rollover rates. Plan ahead and do not wait until your renewal date, when your options might be limited. Bear in mind that contracts can take some time to negotiate. Editor’s tip: Energy contracts can take some time to negotiate. If a supplier takes issue with a contract then it can take weeks to resolve. Fortunately though, gas contracts tend to get resolved more quickly than electricity contracts so it is possible to time the market more accurately. Continuous market intelligence should underpin your energy strategy. Even smaller buyers should keep one eye on the market direction so that you do not get stuck paying over the odds for your gas. There are numerous market reports available to energy buyers, but your broker is continuously monitoring the market and can make informed predictions to help you identify the best time to buy or renew. SMEs are restricted in the ways in which they can buy energy, but other buying methods are open. Flexible contracts allow organisations to purchase gas at intervals throughout the length of the contract, aiming to buy during price dips and to avoid costly spikes. They are the most complex form of contract and require an understanding of the gas market and should include a robust risk management strategy. There are many different kinds of flexible contract, but most are usually only open to large consumers of energy purchasing high volumes. Gas buying groups are a great way of purchasing gas. They depend on several businesses coming together and buying gas collectively so as to enjoy economies of scale. These kinds of groups are normally run by brokers, who partner up several businesses and then help them negotiate a better deal through bulk purchasing. The more businesses in a group, the cheaper it gets. Editor’s tip: The obvious advantage of these buying groups is that they save businesses money, but in my experience of running them, businesses also enjoy a confidence boost from knowing that they are not alone in their energy purchasing. Flexible price purchasing is usually only viable for the biggest energy purchasers, but gas buying groups are a great way for less energy-intensive businesses to take advantage of economies of scale. Understanding the gas market is the first step towards reducing your gas bills. The fastest way to get to grips with gas purchasing is to talk to a broker who will discuss your options and offer coherent advice. Monitoring your gas consumption can help you eliminate waste and negotiate a better rate for your gas. Install a smart gas meter and learn how to track your consumption. Fixed price purchasing is the most common method of purchase for SMEs. Gather market intelligence and talk to your broker to work out the best time to buy. call us today on 0208 150 3772.